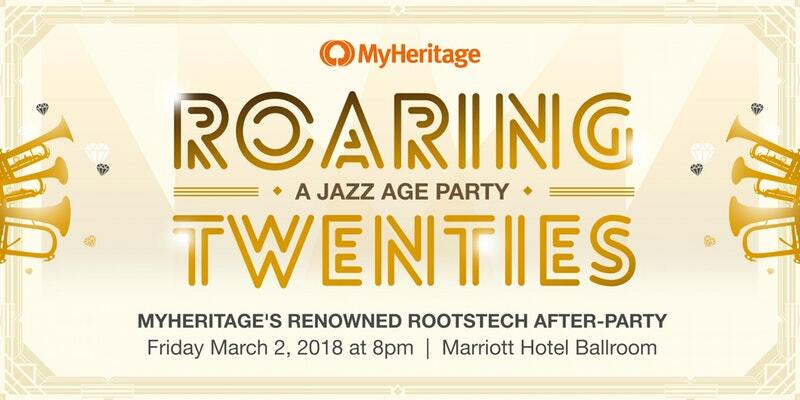 I announced that I had five FREE tickets to give away for the MyHeritage After-Party at RootsTech 2018 in MyHeritage RootsTech After Party (Friday, 2 March) Ticket Contest on Tuesday. The deadline for requests for the tickets was Wednesday night at 11:59 p.m PST. Eight readers submitted an entry. I wish I had had eight passes to give away! But I had to choose five. I did that using the random number generator on www.Random.org. I numbered the entries 1 to 8 and got five random numbers between 1 and 8. 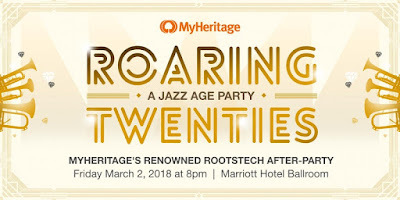 I have emailed each of them and provided the link to obtain the MyHeritage party tickets. * Jamie: "Come up with a file naming system and a folder system for your online documents, PDFs and pictures sooner rather than later. It’s so much harder to fix it the longer you wait." * Tese: "When you are searching a Mc/Mac… name - sometimes it is indexed that ‘M' is the initial for the first name and the rest of the name is the Surname ~ eg: McBarron (my gg-grandfather) is entered as (first name) ‘M’ and (surname) as ‘Barron’. So . . . searching out-side-the-box for ‘crazy’ ideas is OK ! ! !" * Wendy: "Timelines. I work in a genealogy library and sometimes having the patron write down everything that happened in their ancestor’s life will help me ask questions to help them with their brick wall." * Audrey: "Stop and look around. If you understand how and why a record was made, it will help you understand it better, and help you work out alternative solutions when you don't find what you want first time." * Lisa: "I have found so much information from Newspapers! About the biggest find - My mother in law was adopted and I had the name of her birth mother and I was able to use the usual research to find her mother (including Newspapers). I had to use DNA to find her birth father, and it was narrowed down to this one family from Northeastern Iowa. I knew that the birth mother was from Janesville, WI, and my mother in law was born in New York in the mid 1930's. It was becoming a challenge trying to figure it out until I found an article indicating that the one son was visiting his parents (in Iowa) from Janesville, WI and the date about three months after my mother in law was conceived. Since then, we found a possible half-sibling who took a DNA test and confirmed the relationship. So you never know what gems you will find in Newspapers." Thank you to all of the entrants. I hope you all enjoy RootsTech 2018.